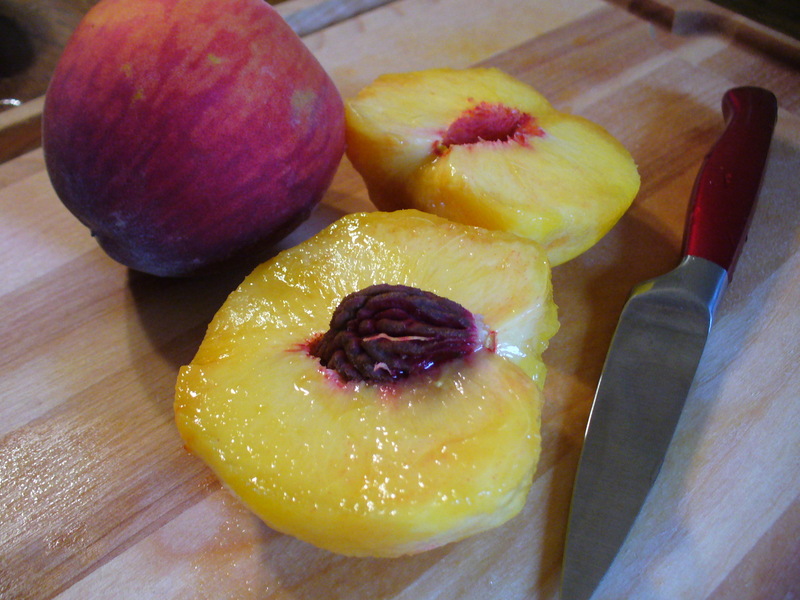 Peach season is in full force here in TN and I know just what to do with those juicy little nuggets of Heaven! This post comes about as a special request from my cousin, Bethany. She asked me for a good peach cobbler recipe and who am I to say no to my dear cousin? First of all, I’m ashamed to admit I’ve never actually made a peach cobbler with fresh peaches. My memories of cobbler at home always included canned peaches, flour, sugar, and milk. Tasty, but my Southern ancestors would shake their head in shame. So my quest begins for the perfect Peach Cobbler. We’ll call this recipe trial #1. It was good, but not perfect, so I’ll try again in a few weeks to see what else I can do. 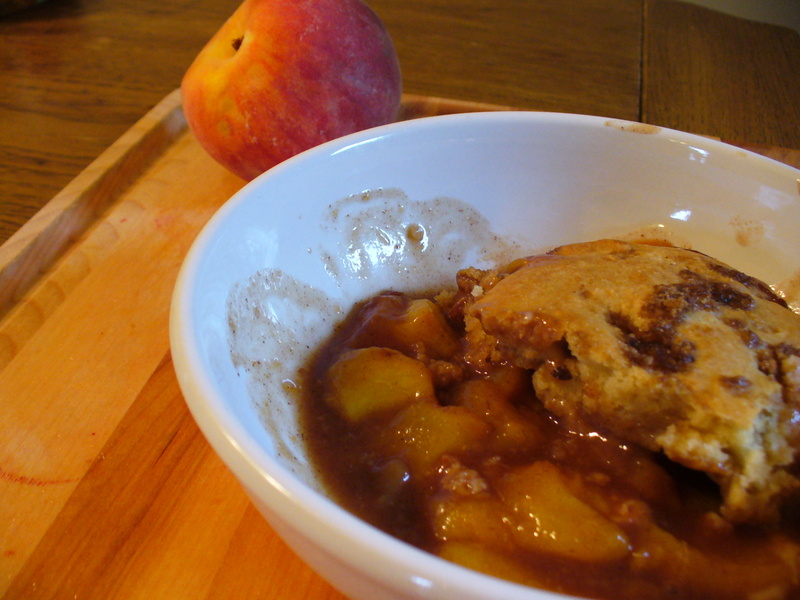 Regardless, it’s a good basic cobbler recipe that’ll get the job done and make your tummy happy. Boyfriend LOVED it. He wanted to eat the whole batch of cobbler for dinner instead of grown up food. One thing to note: I made a small cobbler since there were only two of us eating it. I made it in a 2 qt pan, so you’ll want to double the recipe if you want a larger one. Preheat the oven to 425°. Mix together peach filling ingredients and layer them in the bottom of a 2qt. casserole dish. (Or, you know, whatever pan you’re using.) In a large bowl, mix together dry ingredients for the crust. Next, cut in the butter until the mixture becomes crumbly, then stir in the milk. Dollop the mixture by spoonfuls on top of the peaches. You can very gently spread it around to make it a bit more even if you want. Finish by sprinkling the top with the extra tablespoon of brown sugar. Pop it in the oven and bake until the crust is golden brown and the peaches are all bubbly and happy! (About 20-30 min) I’d recommend serving it with vanilla ice cream, I didn’t happen to have any on hand, but it didn’t stop me from eating some while it was still warm! Enjoy! How do you like to eat your cobbler? Last night I decided to try something different from my usual style of cooking and tried out this recipe with a few adjustments. Let me start off by saying I wasn’t in love with it and I’ll definitely try a few things differently next time, but it wasn’t bad and I have to consider the original recipe is probably better than my adjustments. First of all, I couldn’t find pecorino, so I had to use parmasean. That is probably what effected the flavor most. I read the comments on this recipe and saw a lot of complaints about bitterness and too much lemon, so I used the zest of one lemon and the juice of two. I also used four grated garlic cloves rather than 12 whole, and used two large tomatoes that I didn’t measure, but it was probably more than a cup. The results weren’t entirely what I had hoped for, but after tasting, I knew what was missing and will give you tips at the end for adjustments that I plan to incorporate next time. A word of wisdom: Do all of your prep work before starting. I was cutting vegetables while the chicken was frying in an effort to streamline everything, but ended up with a chaotic mess. Next time, I’ll DEFINITELY do all of my prep in advance. So, without further ado, I give you the recipe and instructions! Start off by prepping all of your veggies. 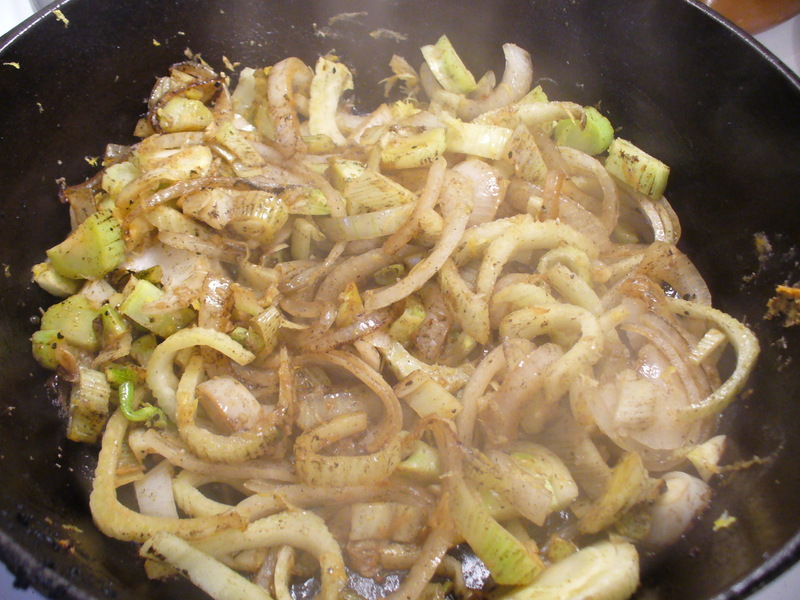 Slice those onions and fennel and sit them aside in a bowl. Blanch those tomatoes and shock them in an ice bath to make them easier to peel, then roughly chop them. 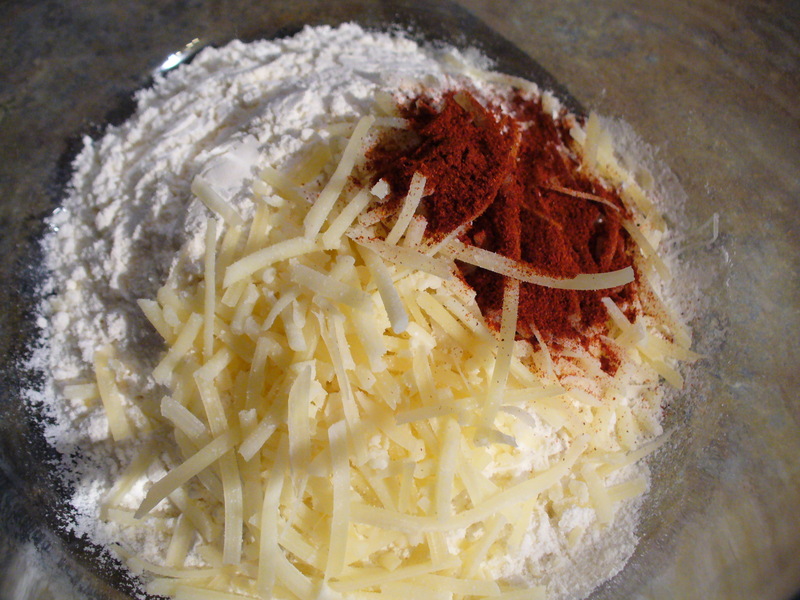 When you’re all prepped and ready, mix your flour, parmesan, and one teaspoon of paprika in a bowl. 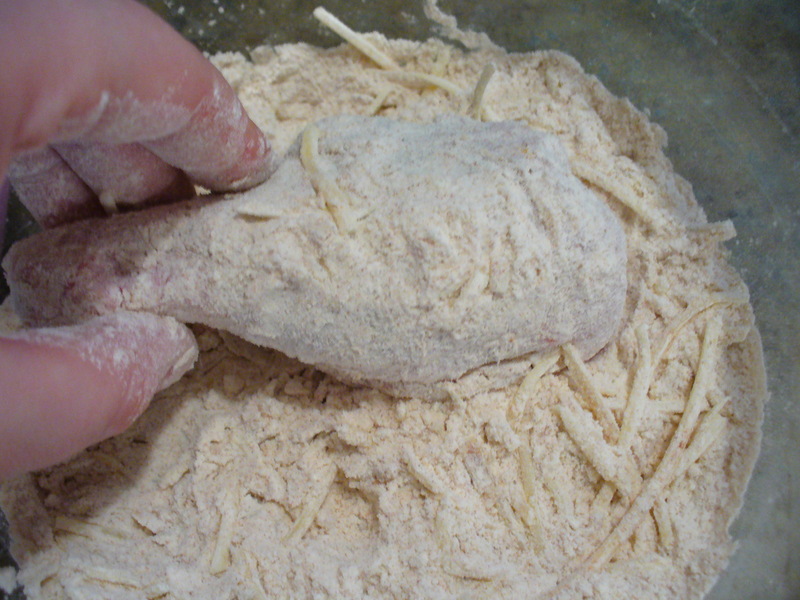 Season your drumsticks generously with salt and pepper and coat them in the flour mixture. Add olive oil to a oven safe skillet or dutch oven and cook on med-high heat until the drumsticks crisp up, about 5 min or so on each side. Add them a few at a time and don’t crowd them too much in the pan. Sit them aside on a plate when they’re nice and brown. Next add your tomatoes, lemon, olives and 2 tsp. paprika, and cook and smoosh the tomatoes until everything is nice and soft. At this point go ahead and give it a little taste and add salt to taste. Add some of your leftover flour mixture to the pan and a cup of white wine. Stir that baby til it thickens up a bit and looks like scrumptious saucy goodness. When your sauce is looking good, add the chicken back to the pan and bake in the oven at 425° for 30 min. Pull it out and enjoy! 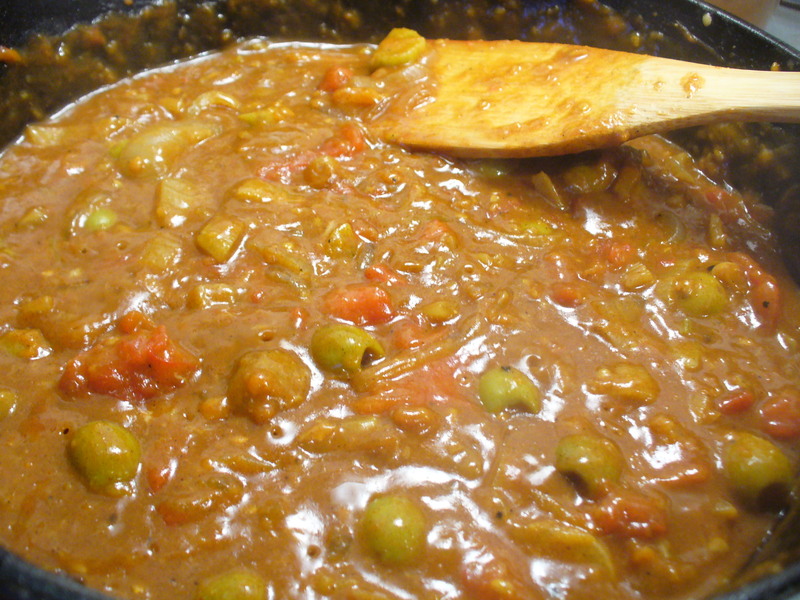 Serve with a veggie and starch. I think it would be great with rice, but I really wanted mashed potatoes, so I served mine with mashed potatoes and a side salad with some of the fennel leaves and homemade croutons. Now for a few thoughts and tips about this recipe. This chicken is suppose to stay crispy when baking it with the sauce, but I found that it wasn’t true for me. 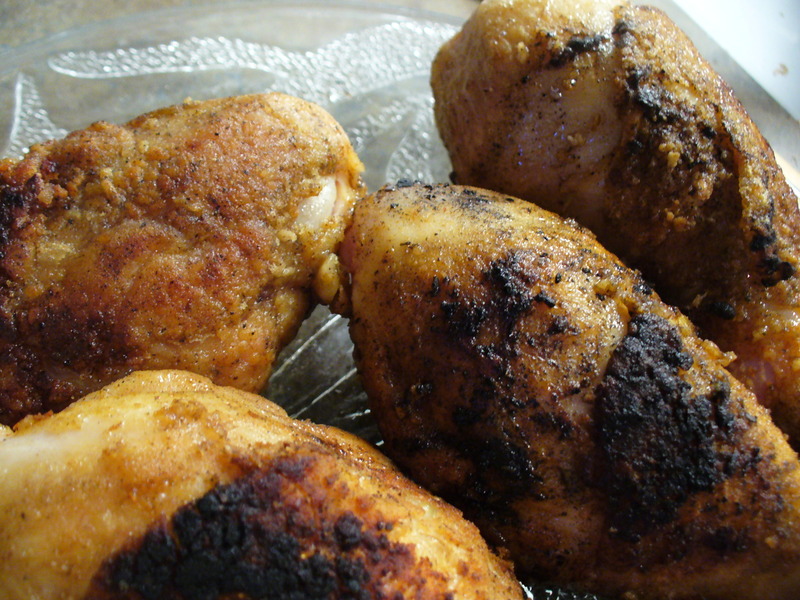 If you want crispy chicken, I recommend finishing it in the oven separately and simply cooking your sauce in another pan. (It won’t have to go in the oven, just the chicken.) 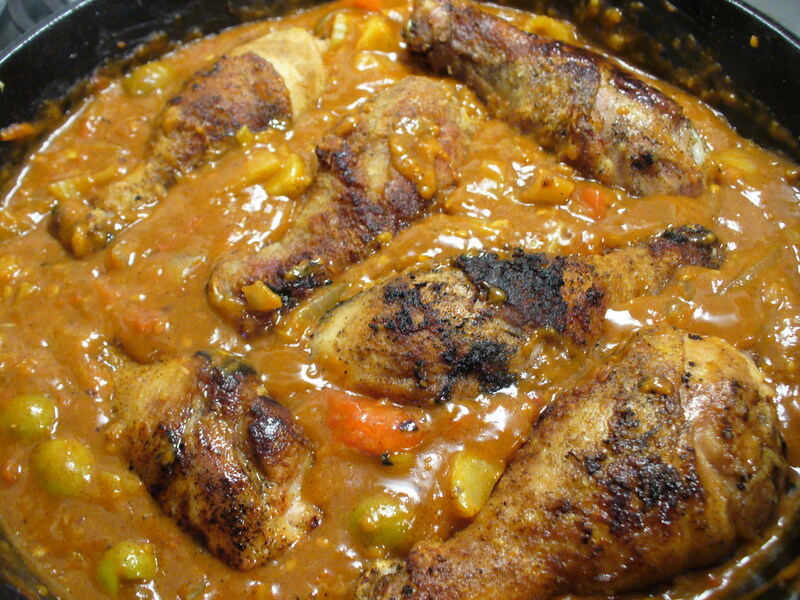 You can pour the sauce over the chicken just before serving and it will maintain it’s crisp. The olives were a little weird for me, to be honest. I liked them, but they didn’t seem to mesh with the flavors well, so perhaps I’ll try a different olive next time or omit it and add green peppers. This dish was also lacking a bit of heat, which is surprising coming from me because I don’t really eat spicy food. I probably would add some crushed red pepper in with the fennel and onions, or jalapeno if you like a little more kick. So, there you have it. 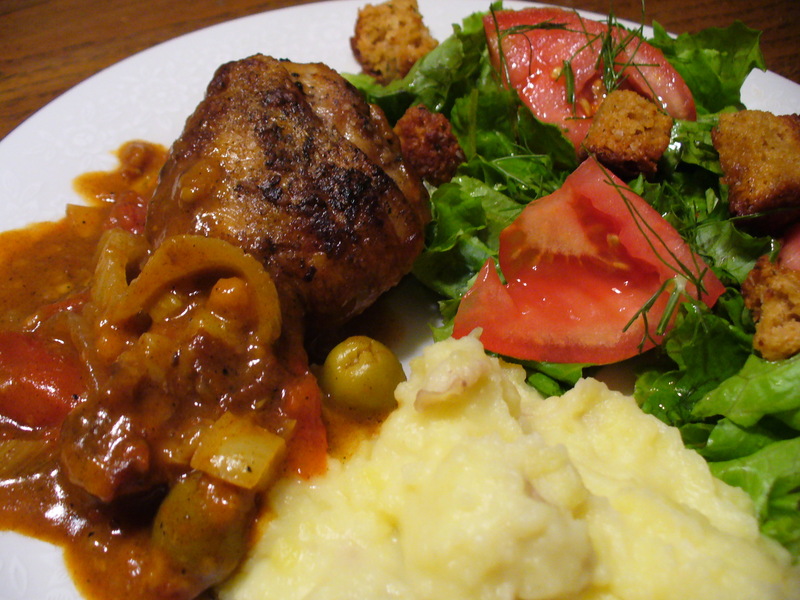 A Spanish inspired chicken with some tips and suggestions for how to make yours even better than mine. Let me know if you try it and made adjustments. I’d love to know what works best for you guys! 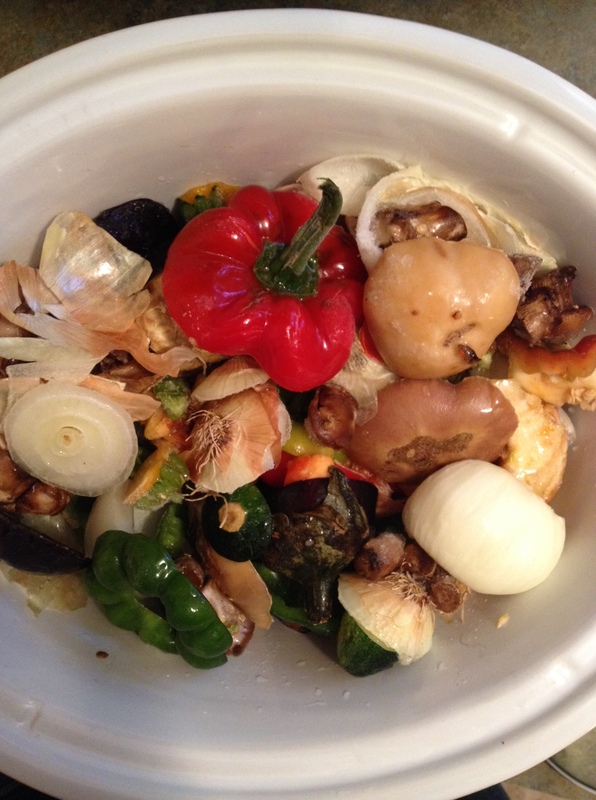 For a vegetarian version, I think it would be tasty with eggplant or portabella mushrooms served over rice. Let me know if you try it! I love balsamic vinegar. I use it on everything: salad, soup, fish, you name it! One of the magical things about balsamic vinegar is that you can open up more culinary opportunities with it by simply removing some of the water. Pizza with vinegar drizzled on top doesn’t sound very appetizing, but if it’s a balsamic reduction the texture is syrupy and delicious, rather than wet. 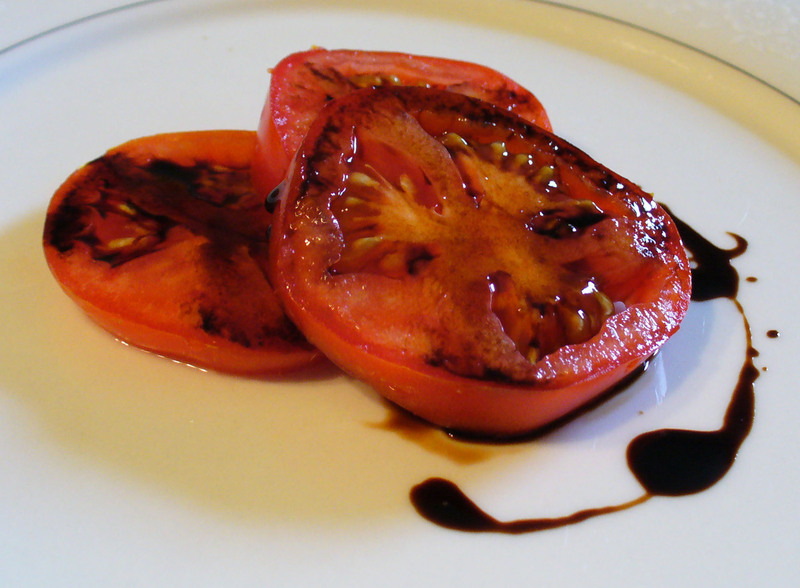 When you reduce balsamic vinegar, the flavor is intensified and sweetened, so a little goes a long way. 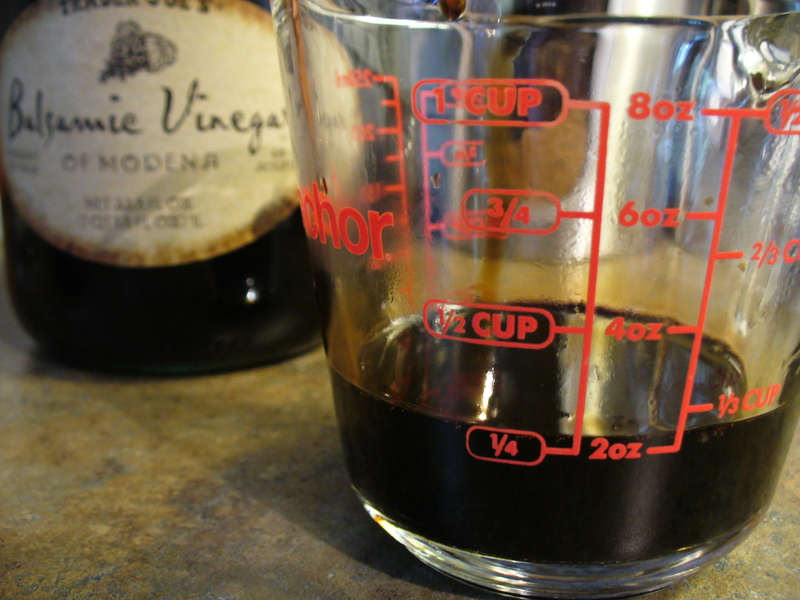 To start off, you want to begin with a good quality balsamic vinegar. It doesn’t have to be expensive to be a good quality. I bought mine from Trader Joe’s. (Can we take a moment to agree that we all love Trader Joe’s?) 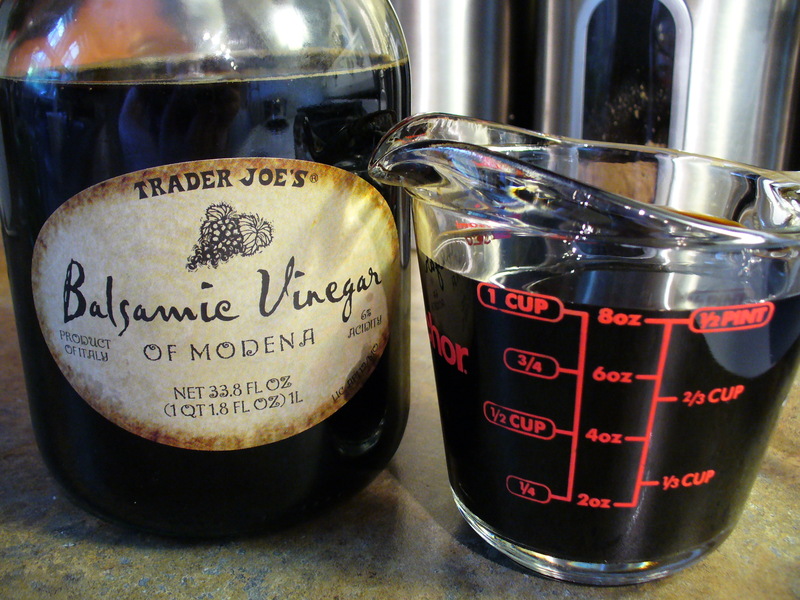 This bottle of balsamic vinegar was just around $5 and it’s comparable to more expensive options. Start off with one cup of vinegar. You’ll get about 1/4 cup of reduction, but unless you’re planning on feeding an army, this should be plenty. It’ll keep for about two weeks in the fridge, so you can do more if you think you’ll use it, but I’m starting off with one cup. Add your vinegar to a medium saucepan and simmer over medium heat. Now, this takes a bit of patience. 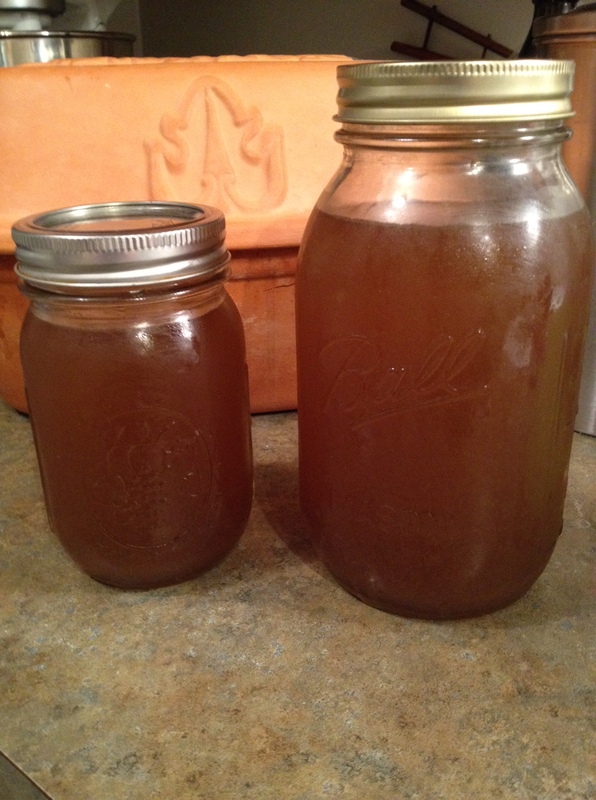 My vinegar took 20-30 minutes to reduce, so it’s a slow process, but all good things take time, right? It’s okay to step away and go about doing other things around the house. Just make sure you give it a little stir every few minutes. Go ahead and turn on a fan, because it’s going to get stinky. You might singe your noise hairs a little bit, but hang in there. You’ll be alright. After about 15-20 minutes or so of stirring every few minutes, you’ll want to pay closer attention. The vinegar may seem like it isn’t doing anything at first, but when it starts thickening, it does it quickly and you don’t want to burn it. Stir it a bit more frequently after the liquid has reduced some and you’ll soon notice the texture of the liquid looks a bit more like honey than vinegar. When it starts coating the back of your spoon a bit and is syrupy looking, it’s time to turn off the heat. I tried to take a photo of this for an example, but it turned out blurry. Sorry. 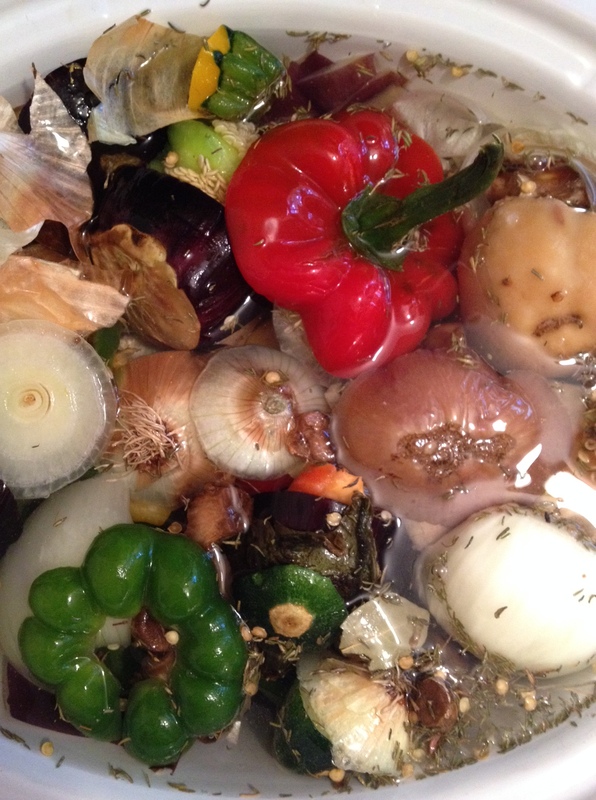 :( Your balsamic reduction will continue to thicken as it cools. You can see here my one cup of vinegar turned into 1/4 cup of reduction. The flavor is much more intense, so you only need a small drizzle for anything you put it on. Use it for Caprese, drizzled on homemade pizza, or strawberry ice cream. (Trust me on this one.) I couldn’t wait to try mine, so I just drizzled a bit over sliced tomatoes. How will you use yours? Are you ready for your mind to be blown? 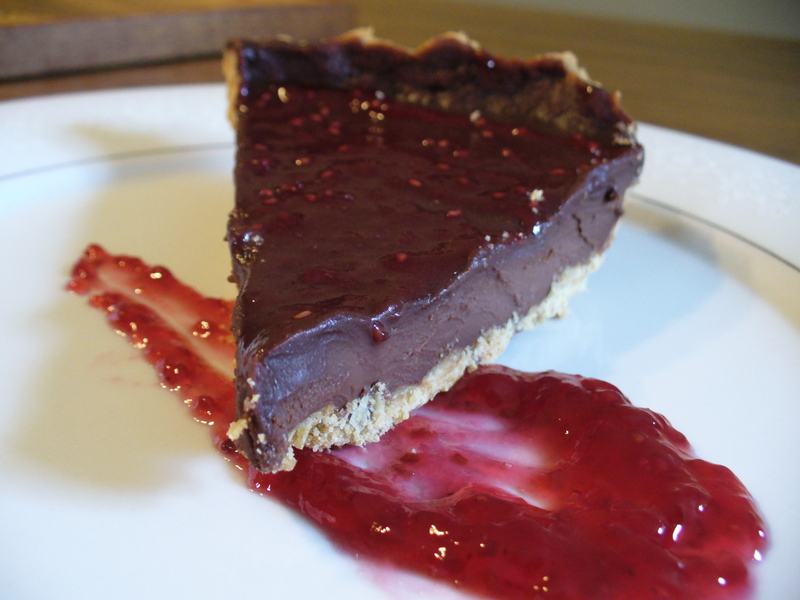 I combined both my love of chocolate truffles and my boyfriend’s love of pie for a decadent dessert anyone can make! I’ll start off by giving you the basic recipe and you can make it your own by adding any number of toppings. Start off by baking your pie crust. My favorite recipe is one I learned from Lisa over at 100daysofrealfood.com. She has a super easy method for making pie crust that I’ve adopted as my go to crust. Seriously, it’s so easy and no-fail, there’s no reason to purchase a store bought crust ever again. 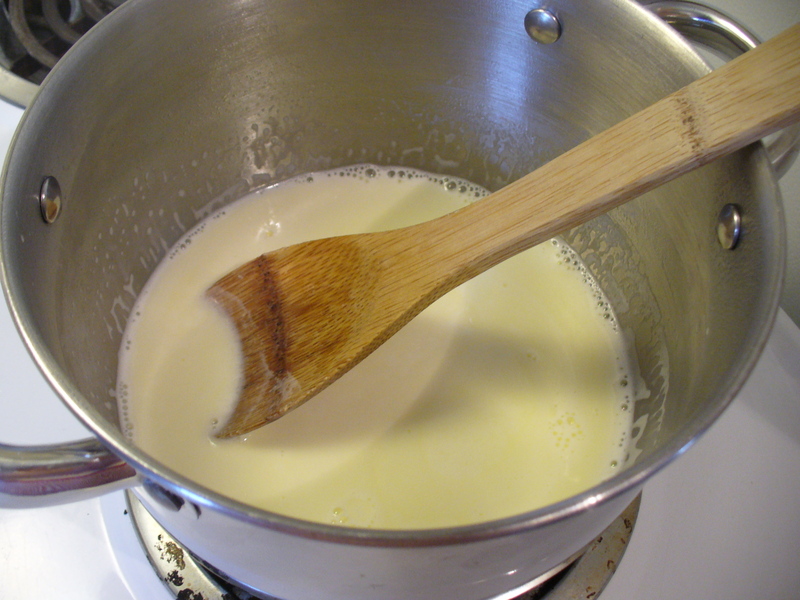 While your crust is baking, slowly warm your heavy cream over medium heat, stirring frequently. Bring it to a low simmer. You want it hot enough to melt your chocolate, but you don’t want it to boil. When you notice a little foam or tiny bubbles and some steam, turn the heat off. You’re done. 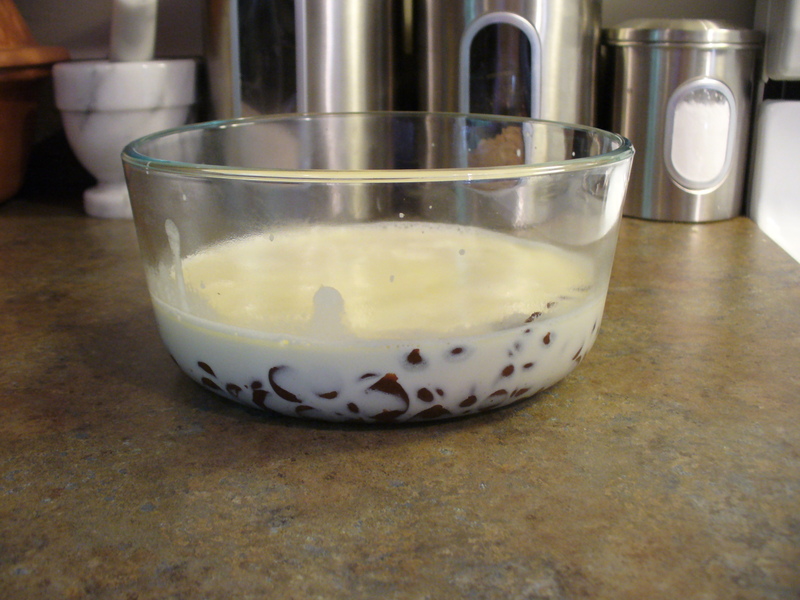 In a small mixing bowl, add your chocolate chips and pour the hot cream over the top of them. DO NOT STIR. Just leave it. Let it sit there for about five minutes without touching it. Step away and go make yourself a drink. Seriously, everyone should have a drink while cooking. Pour yourself a glass of wine or mix up your favorite cocktail. 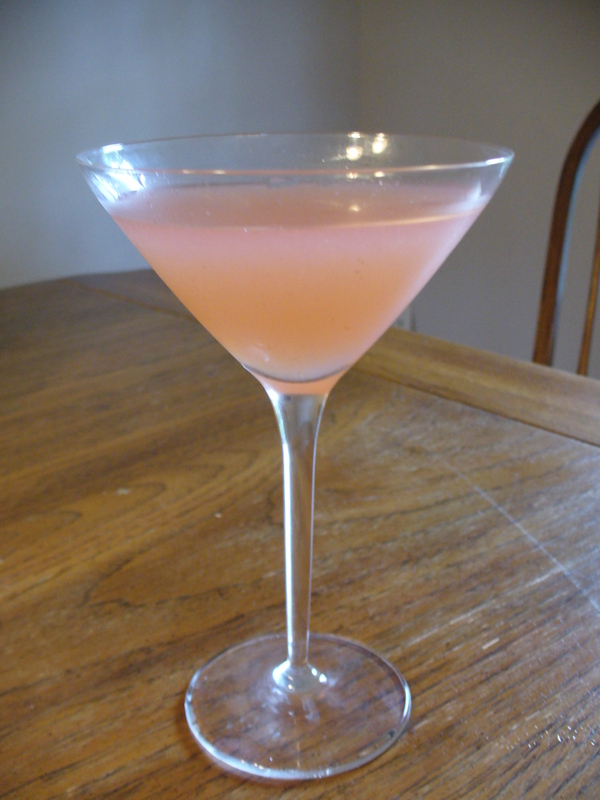 I’m having some strawberry lemonade with gin. After about five minutes has passed, your chocolate should be nice and melted. Go back and stir it until it is mixed up into a consistent texture and the cream is fully incorporated. 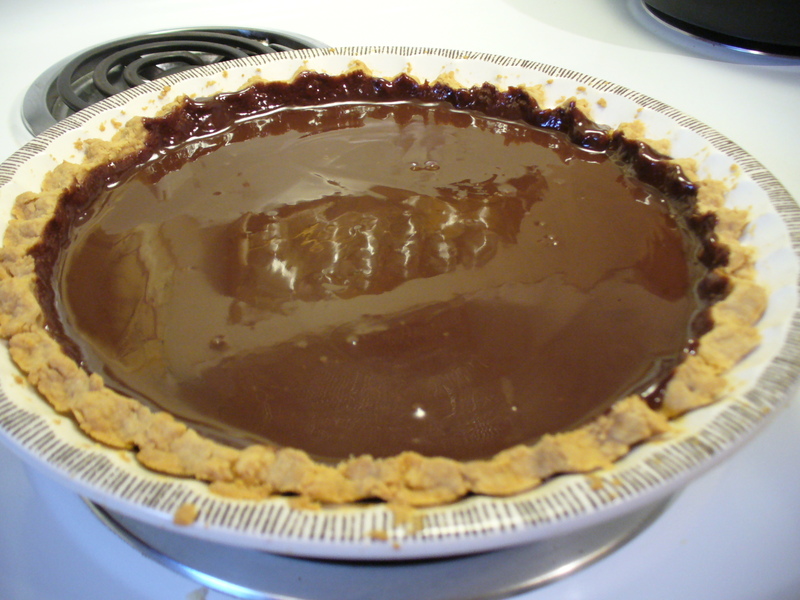 When your crust is done baking, let it cool for about 10 minutes, and then pour that scrumptious melted chocolate in the crust. 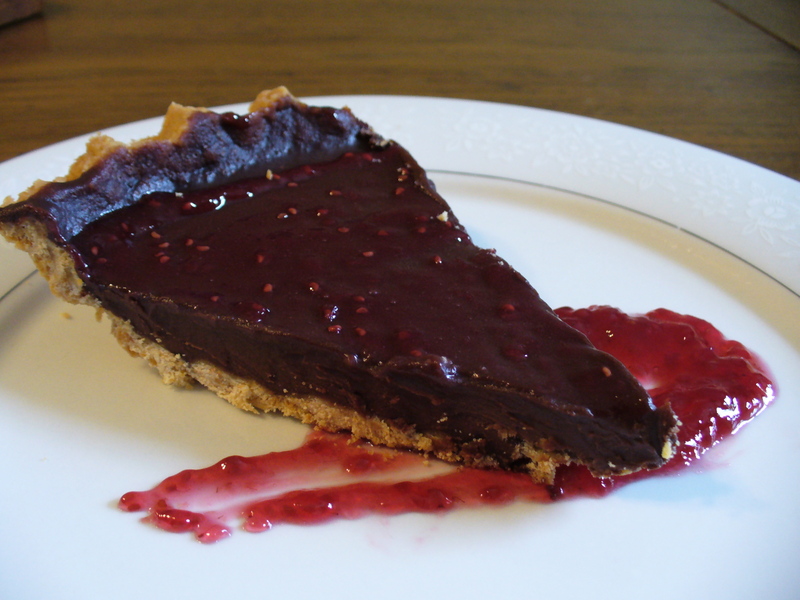 I used a larger pie plate this time, and my filling is a little shallow, so I brushed some of the chocolate up the side of the crust to make it look fuller. Pop that baby in the fridge and let it chill for a couple of hours until it’s set. When you’re ready to serve it, you can leave it as is or change the flavor by adding anything you like. Some tasty suggestions: Jam (I like raspberry), Lemon Curd, Chopped Nuts, Peanut Butter, a sprinkle of Cinnamon, whatever pleases your palate! There you have it, one stunning slice of pie! I topped this one with a thin layer of raspberry jam. Notice the spoon push. You can’t serve Gordon Ramsay a plate without some sort of sauce and a spoon push. That’s it! You’re done. Now get ready to bake away and impress all your friends. I’d love to hear how you make this recipe your own! Leave me a comment telling me what flavors you incorporated and share your photos on facebook!